Give your nurses the confidence and skills they need to think independently and display high levels of clinical judgment. 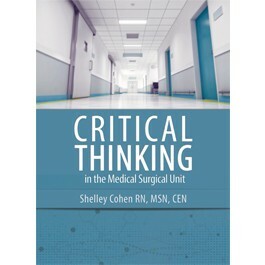 Critical Thinking in the Medical-Surgical Unit is filled with resources and assessment tools, usable by both new and experienced nurses, to build a culture of critical thinking directed toward the best interests of the patient. In addition to the book, downloadable tools will help readers apply the theories and methods taught in a variety of situations. Shelley Cohen, RN, MSN, CEN is the founder of Health Resources Unlimited, a Tennessee-based education and consulting company that focuses on teaching triage, successful leadership principles, and critical thinking concepts. As the author/co-author of 18 books and more than 50 published articles, Cohen coaches and mentor’s nurses with a focus on improving triage decisions and patient outcomes. For more than 40 years she has held a variety of roles as both a staff nurse and nurse leader. In addition to her role as an international speaker and educator, she continues to work p.r.n. as a staff emergency department nurse in Tennessee. She believes that successful transition from nursing student to success as a new graduate nurse is partly in the hands of those who teach them critical thinking skills. Her free, monthly electronic Triage Tip of the Month promotes ongoing critical thinking and is read and shared by nurses across the world. Shelley and her husband Dennis work with our Purple Heart heroes through the Wounded Warriors in Action Foundation (www.wwiaf.org). As Associates they sponsor outdoor sporting events at their home in Tennessee that serve to heal the emotional challenges of living with life-long enduring physical and emotional injuries. If for any reason this product does not meet your needs, return it within 30 days and you will receive a prompt, polite, 100% refund—no questions asked. We guarantee it!